This model is sold only in certain areas. The printer unit has the same printer unit, external appearance, and printing functions as that of the TM-L90. (2) Direct printing using a Web application through the network. (5) (only for users in Japan) Compliant with OFSC* standards and capable of establishing an OES*/POS system without the use of a computer. This model is sold only in USA. 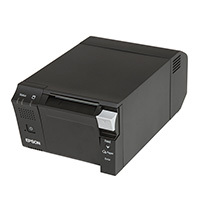 The printer unit has the same printer unit, external appearance, and printing functions as that of the TM-T20II. Because of the following feature, you can construct an OES/POS system without using a PC. 3) Standardly equipped with Ethernet interface, 2 USB host ports, and 1 serial port. This model is sold only in Europe, USA, Australia, Taiwan, Hong Kong, Singapore. 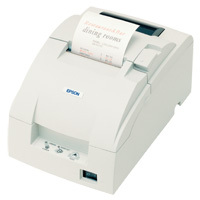 TM-T70-i is a high-speed thermal receipt printer that incorporates the high quality and reliability of TM-T88 Series. TM-T70-i allows for full-front operation, and its unobtrusive, quiet printing is ideal for specialty and hospitality environments. This model is sold only in Europe, USA, Australia. TM-T70II-DT has the function to seamlessly connect POS peripheral devices and server services. By using TM-T70II-DT, the users can construct POS solutions of the next generation that have excellent connectivity and services. • Receipts are ejected to the front and roll paper is replaced from the front, allowing installation on a shelf beneath a counter. • The power switch, feed button, and LEDs are also located on the front. 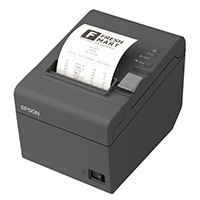 TM-T70II -DT2 consists of the thermal receipt printer TM-T70II with a built-in controller and can connect POS peripheral devices and server services seamlessly. This model is sold only in China, Singapore, Taiwan, Hong Kong. 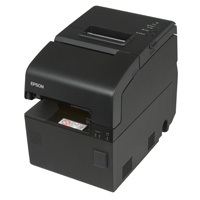 The printer unit has the same printer unit, external appearance, and printing functions as that of the TM-T82II. 4) Standardly equipped with Ethernet interface, 2 USB host ports, and 1 serial port. This model is sold only in Korea. 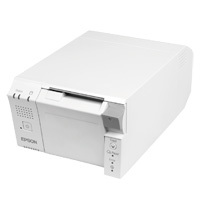 The printer unit has the same printer unit, external appearance, and printing functions as that of the TM-T83II. Because of the following feature, you can construct an OES/POS system without using a PC. This model is sold only in Europe, USA, Australia, Singapore. 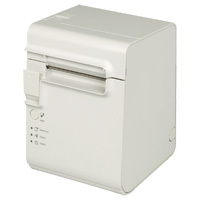 The TM-T88V-DT has equipped auxiliary storage and a Windows-operated controller in the printer. You can use it to control POS peripherals. •The OS employs Windows Embedded POSReady7 & Windows Embedded POSReady2009, and provides functionality as a Windows PC. •Built-in serial ATA memory device usable with POS applications or databases. •The ePOS-Device API enables the web application to control POS peripherals directly through web browser. •Deployable the Web application in Apache HTTP Server of product available for server-side scripting. Also you can use SQLite database. •The ePOS-Device XML enables the native application to control POS peripherals directly from mobile terminals. •Usable the pre-installed software required for the Thin-Client environment as the virtual desktop, application client and printer. This model is sold only in Europe, USA, Australia, China, Taiwan, Hong Kong, Korea, India, Singapore. 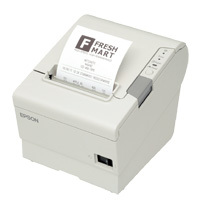 TM-T88V-i is the high-speed thermal receipt printer with compact design. The printer unit has the same printer unit, external appearance, and printing functions as that of the TM-T88V. - Direct printing using a Web application which does not depend on OS and web browsers. - Capability to control using POS application using interface for POS peripheral device connection. - Standardly equipped with Ethernet interface, 4 USB host ports, and 1 serial port(only the model with serial port model). TM-T88VI-DT2 consists of the thermal receipt printer TM-T88VI with a built-in controller and can connect POS peripheral devices and server services seamlessly. 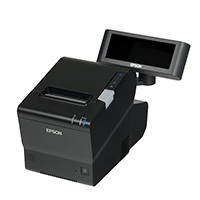 - Equipped with USB and serial interface which enable connection with peripheral devices such as a customer display and barcode scanner. - Supports Device Data Notification function that enables your application on a Web server to start upon input of data from a peripheral device such as a barcode scanner. - Equipped with Web server that supports the scripting language "PHP" and database "SQLite3". 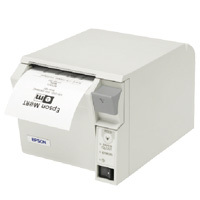 TM-U220-i is a receipt printer which can print directly from a smart device application or Web application. This product supports ePOS-Device *1 and ePOS-Print *2 and are capable of controlling POS peripherals or network compatible TM printers. 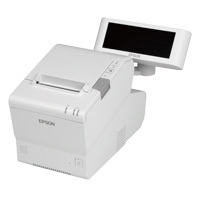 *1: ePOS-Device: Epson original technology to control TM printers or POS peripherals via a smart device application or Web application. This technology is realized by ePOS-Device Service running on the products. *2: ePOS-Print: Epson original printing function that has a high compatibility with a variety of systems supported by XML and Web services. 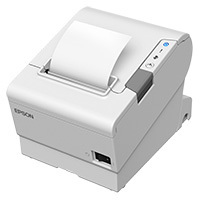 This technology is realized by the ePOS-Print Service running on the products.